Before we left for the family reunion we received a call that the route we normally take had a road closed due to construction. Chuck looked up a different route and off we went. While on the road our alternative route had a detour and again we were on an alternative route. The route took us off the beaten path and it was such a pleasant drive. We drove by field after field of corn, soybeans and even tobacco. Seeing tobacco in Indiana is not a usual sight. Of course all of those fields meant that we drove by many farms. Can you see the Mail Pouch painted on the barn? We also passed many small towns. Some were larger then others and many were just a sign with no town in sight. The one little place that really caught our eye is Vernon, IN. We drove though this railroad tunnel to get into town. I looked it up and found out that this is called the Vernon Tunnel and was built in 1838 for the Madison and Indianapolis Railroad (M&I RR). We could tell from the homes and downtown buildings that this town was old and had been cared for though the years. It was the county seat. I love the clock tower on the county courthouse. We were able to tell how rural this county was by the small population of around 700 in the country seat. This building is the old blacksmith! It isn't often that you find that building still standing in town. We thoroughly enjoyed our drive off the beaten path! There was a family reunion for Chuck's family over the weekend. Their family is spread out between Indiana and Kentucky so the reunion is held in a state park close to the Indiana/Kentucky state line. Its claim to fame is two falls. Usually they are dry or just a trickle of water is going over the falls. Due to adequate rainfall this summer the falls were beautiful! After a wonderful meal we set off for a hike. Along the way we bumped into some cousins and it made it fun for Megan to have someone to splash around with in the water. With the running water this was the most beautiful hike we have taken through this park. I always enjoy visiting with his family and am already looking forward to next year. I don't know what has gotten into me but I have been this cleaning and organizing crazy woman! Everything had to be taken out of the pantry so we could wipe something up. Since everything was out I decided to work on a project that has been on my mind for years. I have wanted to paint the inside of the cabinets white since I painted the outside several years ago. The white inside made such a huge difference! From experience I knew that all of those canned goods sliding around would be hard on the painted shelves. I added some shelf paper to help the shelves wear better. I love how bright and clean this makes the cabinet look! I am looking forward to painting the inside of the rest of the cabinets. I also wiped down and rearranged the cabinet above the dryer. There was tons of wasted, unused space in here. I threw out a few things and then moved some things from the cabinet above the washer and the over flow pantry in the spare room closet. A much better use of this space. I have a corner cabinet in the kitchen that has some storage space on the bottom. This place had become a pit! I wiped it out and then put a few items in the give away box. All of the plastic ware that Megan takes in her lunch (we tried sending real silverware but a few pieces never made it home) was placed in a small cardboard container and then everything I choose to keep was put back in orderly. Ahhhh, much better! Now I have caught the organizing bug and hope to continue cleaning and organizing behind the cabinet doors. If you have been reading for a while you know that I have a love for Mason Jars. :) My parents stopped by one day last week and Mom had a surprise for me. My only complaint is the labels as they don't stick well. You can see a little in on the bottom jar that the sticker is coming loose on the sides. I am going to see if I can find some cute labels that I can print off. That way they will stick well and look better then having my chicken scratch across them! I will be able to stack them four tall in my baking cabinet which will clear up some much needed space. I have already added these cuties to my Christmas list! Groceries for $1.96. The drinks are a treat for lunch boxes and were $0.98 each after coupon. The lettuce and bread were free with a $10.00 purchase. I was already going there to spend over $10.00 so this was a bonus for that shopping trip! The air conditioning has been off and the windows open for three days this week. Mid August in Central Indiana... wow! We recently ordered pizza (yes, I know not frugal!) and they had a deal that you could add on an additional large pizza for $0.30. The extra pizza was frozen and made for a quick, inexpensive meal on a night when I had no desire to cook. We still have enough in the freezer for another meal and a lunch or two. Picking goodies fresh from the garden. One the slats on the blind pictured on the left had broken. The OCD in me can't stand it when blinds don't look nice. 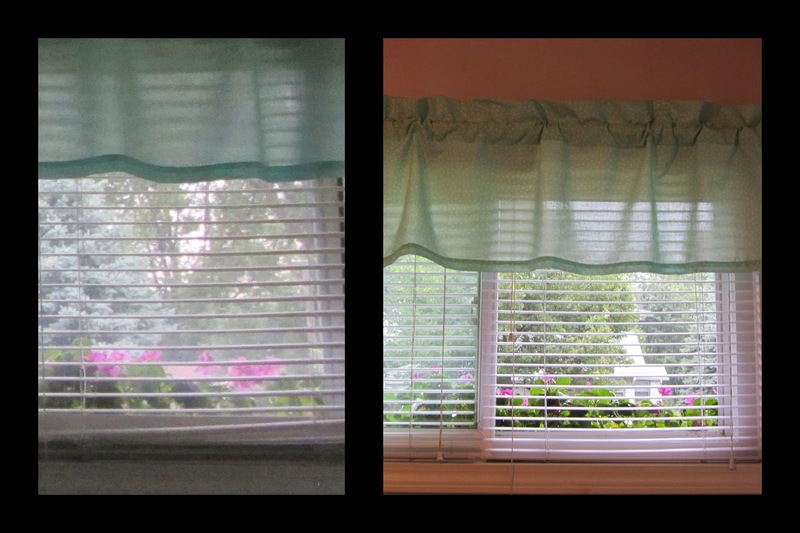 :) Chuck had saved some slats when he shortened the blinds and had it replaced and looking good as new in just a few minutes. So there you go. I hope this encourages you to do things to save money. The old adage that every penny counts seems to apply more and more as I see prices of just about everything increase. I am not sure I will have five things to post about every week as many times my frugal accomplishment is simply staying home and making do with what I have. I find it encouraging to hear about others frugal adventures.